Patricia “Peaches” Jones is a movement artist specializing in dances and rhythms of the African Diaspora. She has been honored to study diasporic movement, rhythm, and culture for over 20 years with amazing artists and teachers from Guinea, Senegal, Mali, Cuba, Brazil, and the United States. In addition to her artistic practice, Peaches worked in public health for over a decade dedicating her time towards her other passion for healing communities. Currently, Peaches dances Lela Aisha Jones | FlyGround and Kulu Mele African Dance and Drum Ensemble, Philadelphia’s premier African dance ensemble. 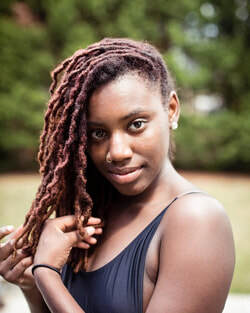 Additionally, she is working to develop choreography, classes, workshops, and experiences that utilize the healing properties of diasporic rhythms and movement to cultivate physical, emotional, and spiritual well-being for individuals and community. ​Julie B. Johnson is a dance artist focused on intersections of creative practice, community interaction, and social justice. She is interested in dance taking place in and out of the studio, on and off the stage, and anywhere in between. 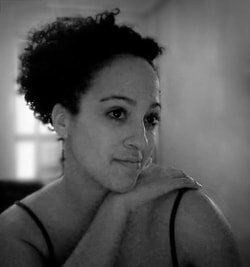 Julie is a Dance Lecturer at Spelman College and serves as an editor of The Dancer-Citizen, an online scholarly journal exploring the work of socially engaged dance artists. She is thrilled to work with Flyground as an advisor and strategist, and also as a member of the coordinating committee for Flyground's initiative, Dancing for Justice Philadelphia. 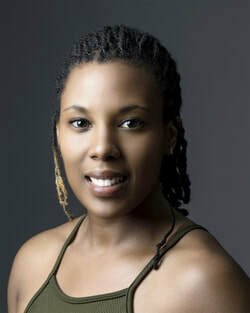 Julie earned her PhD in Dance at Temple University where her research focused on meanings and experiences of 'community' in a West African dance class in Philadelphia. Amanda L. Edwards is from Mount Vernon, NY. She began her training at The Dance Theatre of Harlem, where she participated in the Community Program, Summer Programs, and the Pre-Professional Program. She attended Earl Mosely Institute of the Arts during the summers of 2013 and 2014. She graduated from The University of the Arts with honors in May 2015. Amanda participated in the Nomad Express Choreography Lab for three weeks in Burkina Faso, West Africa during summer 2016.She has worked with choreographers such as Iquail Shaheed, Jen McGinn, Olivier Tarpaga, Esther Baker-Tarpaga, Kim Bears-Bailey and Meredith Rainey. 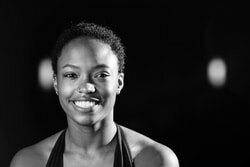 Amanda is currently a dancer with Dancespora, Putty Dance Project, Lela Aisha Jones | FlyGround, and Klassic Contemporary Ballet Company. Arielle Pina is a Philadelphia-based artist hailing from Boston, MA. She explores topics of equality with collaborators of many disciplines to create a cohesive, diverse body of work. She received her Bachelor of Fine Arts from The University of the Arts, and received The Nadia Chilkousky Nahumck Award for Creativity and Dance-Making. She also attended the Headlong Performance Institute, a post baccalaureate in hybrid performance. Since graduating, she has shared her work at dance venues and film festivals in New York, Philadelphia, Boston, San Francisco, Belgium and Paris. Aya Razzaz is a choreographer and performer from Syria, Palestine and Jordan based in Philadelphia. Aya’s work lives in the intersection of social justice and performance, and revolves around the somatic experiences and narratives of Arab refugees. Aya continues to investigate where displacement lives in the body and how we, as a society, view, carry and disregard refugees in our communities. 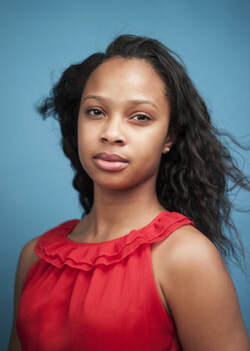 Zakiya L. Cornish is a New Orleans native currently residing in Philadelphia. Classically trained in West African dance, she worked as a New Orleans-based independent performer and teaching artist for several years and is well known as a stellar teacher of traditional and contemporary African dance classes across the country. Her graduate research at Temple University entailed an exploration of the intersections of African American identity and West African Dance. Zakiya is a former member of Lela Aisha Jones | FlyGround and Kulu Mele African Drum and Dance Company. Through her connections with these companies, she has worked with Tony-award winning choreographer Jeffrey Page and the renowned Ron K. Brown of Evidence. Zakiya’s choreographic work focuses on traditional and contemporary dance and music of the African Diaspora. ​Danielle Currica is Guyanese American movement artist. Beginning her training in Memphis TN, she attendied Virginia Commonwealth University. That summer she would begin working with Philadelphian dance companies DanceTheaterX and idiosynCrazy productions, and later with choreographers Meredith Rainey/Tania Isaac, Kate Watson-Wallace, and Megan Mazarick. She received a 2015 Rocky Award for her dance and admin work with organizations <fidget>, Dance/USA Philadelphia, Ars Nova Workshop, and Headlong. Joining Peek-A-Boo Revue in 2009, she would elevate to choreographer and soloist- Sophie Sucré. Featured with NY based Brown Girls Burlesque in 2012, she has since headlined The Burlesque Hall of Fame, Philadelphia, New York, and Colorado Burlesque Festivals, Philadelphia Pin-Up Peep Show, and the 2017 Munich Burlesque Festival. In 2012, Danielle helped establish the Philadelphia Burlesque Academy, as teacher and mentor to the local professional burlesque community.